alaTest has collected and analyzed 34 reviews of JVC GR-DF550. The average rating for this product is 2.9/5, compared to an average rating of 4.0/5 for other Camcorders for all reviews. People really like the reliability and size. The portability and price are also appreciated. The viewfinder and durability get critical comments, while there are mixed opinions on the design and zoom. We analyzed user and expert ratings, product age and more factors. 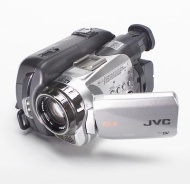 Compared to other Camcorders the JVC GR-DF550 is awarded an overall alaScore™ of 77/100 = Good quality. alaTest has collected and analyzed 27 user reviews of JVC GR-DF550 from Amazon.com. The average user rating for this product is 2.9/5, compared to an average user rating of 3.9/5 for other Camcorders on Amazon.com. People really like the image quality and portability. The usability and size are also mentioned favorably, whereas many are negative about the battery. 59% of the reviews on Amazon.com give this product a positive rating. Impressive video quality for its class; above-average low-light performance; top-loading cassette; simple onscreen interface; supports video capture from analog devices; microphone input; wireless remote. Boxy design; complex controls; low-quality still images; terse manual. JVC's GR-DF550 midrange camcorder may not have any standout features, but it's a video workhorse that delivers solid results. Low-cost, lightweight camcorder with 15X zoom is held back by awkward design, disappointing video quality. Although the inexpensive JVC GR-DF550US has some nice features and great low-light performance, the lackluster image quality, short battery life, and awkward handling make this camera difficult to recommend. The JVC GR-DF550 gives you clear images, smooth footage, and even some odd effects to play with. JVC GRDF550U 1.33 Megapixel Digital Video Camcorder with 15x Optical Zoom / 700x Digtial Zoom. The JVC GR DF550U model offers a Live Slow feature that makes it possible to record slow motion images and play them back with real-time sound. Footage shot at normal speed can be played back in slow motion with real-time sound. Experience the extraordinary with the GR-DF550. Its EZ grip design puts total control in the palm of your hand. But it's not just the comfortable feel that makes the GR-DF550 a powerful performer. Thanks to its 1.33M CCD imager you'll enjoy 540 lines of high resolution video. JVC's exclusive Low Light Plus incorporates two key technologies: The F1.2 Super Bright Lens obtains twice the light of an F1.8 lens assuring a bright picture with less noise even in less than desirable lighting conditions. And Three Dimensional Noise Reduction (3D NR) eliminates picture noise up to 30% in low light situations. JVC's exclusive Megabrid Engine applies separate optimized processing for high resolution video and superior digital stills. Keep your subject in view outdoors with a 2.5 inch Clear LCD that reduces glare and reflections, and a built-in auto " Illumi-Light" for 1/10th the power consumption. There's also a color viewfinder, Power-Linked Operation, Night Alive, and 700X Super Digital Zoom with Spline Interpolation. Record HG digital stills at up to 1600 x 1200 to the SD/MMC card slot. There's also an accessory shoe and mic input with plug-in power. Be your own director with the power and performance of the GR-DF550.